Every since I was I was little I have loved straws. Especially the Krazy Straws! Now that I’m older, I like to craft with straws! 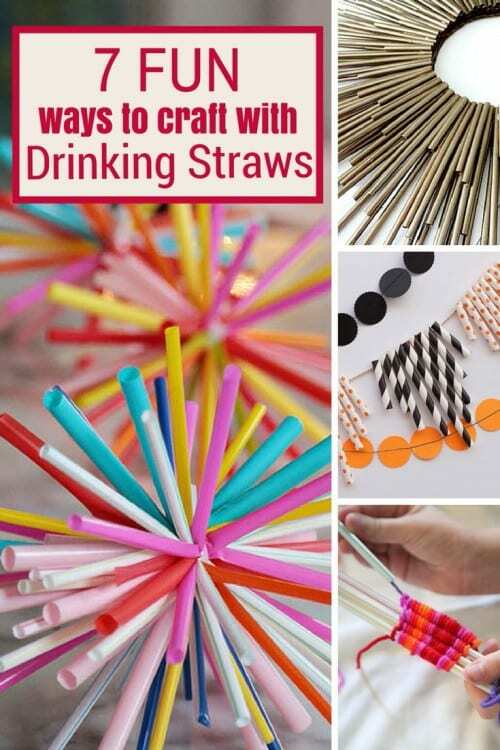 Here you will find 7 Fun Ways to Craft with Drinking Straws. Simply click the title below the image to get to the craft tutorial. Use straws for something besides drinking chocolate milk! A collection of 7 Fun Ways to Craft with Drinking Straws. What have you made using Drinking Straws? Share and leave a comment below! SAVE 7 FUN WAYS TO CRAFT WITH DRINKING STRAWS TO YOUR FAVORITE DIY PINTEREST BOARD! So many creative ideas! I love the little straw easels. Cute ideas! This is a great way to use up straws if you have extra you don’t need. Thanks for these ideas! You are so welcome and thanks for the nice comment! Whaaat – Straw weaving? Hanging out at the #HomeMattersParty is my way of getting away from yarn for a bit, and now I want to make more yarn crafts, lol! These are all great projects. Thanks for sharing them! You are so welcome Jenny! I’m glad you found something new. all these are cute ideas.I really like the idea of garland. There are so many fun ways to use straws. I love the orange and black ones – they just scream “Halloween”! I love the little easels. Those are the cutest things ever. They have come out with the best looking straws now. I used straws in a vase and cut a little slit at the top for a photo to stand in. Then used them as table decor at my son’s graduation party. It was easy and they looked great. Plus I was able to get the colors he wanted for his party. Win, Win!!! This is a great post. Thanks! That is such a great idea, Michelle! Thanks for sharing. Straws really are so versatile. Who would have thought!? AWSOME CRAFTS!!!!!! I LOVE your work! Im nine but I love art so thanks! My favorite is the drinking straw sunburst also. I never would have guessed that’s what it was made from! Thanks, Teresa! Isn’t it cool when you can make super cool decor pieces out inexpensive items?! Hi, I love the crafts!! I do too Kestyn! Welcome to the Crafty Blog Stalker! Let me know if there is anything I can help you with! For the straws…you can also put the ends together and make long straws, bracelets and necklaces. My girls and I used to do that when they were little….They loved wearing straw jewelry that they made themselves. I love that Beth! Thanks for sharing such a fun idea!